August | 2014 | LIT.GAZ. Back to my roots as a teacher of literature for this one: an excellent biography of the poet George Herbert, whose works I never actually had the good fortune to teach, apart from using a couple of his poems to teach general practical criticism. Alas, his poetry nowadays, along with other Metaphysical Poets such as John Donne, Andrew Marvell and Henry Vaughan, has been judged to be too difficult for today’s sixth form students… yes, I actually had an examiner say that to me, a few years ago. It is a detailed, thoughtful and sympathetic biography of a wonderful poet with a masterly fluency with the English language, from that Shakespearean and post-Shakespearean period when the English language was bursting into full bloom. Herbert died , probably of consumption, before he was 40. He seems to have been the epitome of the Church of England clergyman, in the early days of the Church of England, before the Civil War, a man who was fortunately sheltered from the violence, torturing and persecution taking place in his time. Drury weaves much careful exploration and revealing analysis of Herbert’s poetry into the story of his life; layers of meaning are teased out and new aspects revealed – to me, at least. It wasn’t an easy read, but an enlightening one. What comes across most strongly is Herbert’s deep religious faith and trust in his God, speaking from an age that we can nowadays hardly begin to comprehend. An excellent read, a book which refreshed my pleasure in Herbert’s poetry. So, following on from my previous post, I tried to think of a couple of texts to compare, and came up with Sebastian Faulks‘ Birdsong, and Pat Barker‘s Regeneration Trilogy. Both texts are set in the First World War, both were written in the 1990s. What differences are there to observe between a male and female novelist? The central characters in the main part of Birdsong are male: it’s set in the trenches. The overture to the story features the hero’s passionate affair with the wife of his employer several years earlier, and the hero’s story is being researched by his granddaughter. There are rather more female characters in Regeneration, and more completely integrated in the structure of the story. Both novels contain graphic details of warfare, injuries, death and destruction. The mental effects of warfare appear in both. In many ways, Birdsong feels like a more ‘traditional’ novel, with a fairly conventional structure, although the central narrative is framed by earlier and later years. The Regeneration Trilogy – which is therefore rather longer – is more complex, more diffuse, with a number of plots loosely converging and intertwined: treatment of shellshock at Craiglockhart, the relationship between Owen and Sassoon, the relationship between Sassoon and Graves and the former’s protest against the conduct of the war, various political intrigues during the FWW, the work of Rivers the psychologist, the relationship between the shellshocked Billy Prior and Sarah Lumb, women’s work during the war… Home Front and Western Front take on equal importance, it seems to me. The central relationship in Birdsong is that between Stephen and his friend Weir, and we are constantly aware of Stephen’s distancing himself from what he is experiencing. The horrors of combat are foregrounded, and graphically described; the enduring and psychological horrors are revealed as his granddaughter gradually uncovers more and more of his story many years later. Although Barker can match Faulks in terms of graphic details of conflict and its consequences, it’s not her primary focus, which is the mental and psychological effects of combat and the stress of the frontline on officers and men, and the attempts to treat it, to rebuild the men who are suffering (so that they can then be shipped back to the front!). She explores a range of different relationships – peer to peer, superior to inferior, male/ male and male/female. Both writers clearly researched their subject-matter in great depth; both adopt a no-holds-barred approach to unpleasant detail: there is not much to choose between them here. Yet, in a blind reading, if asked to decide which of the two was written by a man, I’m sure most would go for Birdsong. If asked to read Regeneration and then identify the gender of the author, I’m not so confident about readers’ ability to identify a female writer. Why? It’s very difficult to nail down. Is the tightness of Birdsong’s structure, and of Faulks’ writing, self-evidently masculine? Is it the openness of Barker’s treatment of both characters and subject-matter, the looseness or freeness of scope, structure, direction a more female trait? If you’re interested in exploring these issues, I recommend these two novels, and will just append two others for you to think about: All Quiet on the Western Front, by Erich Maria Remarque, a classic from 1929 that most will have heard of, and Not So Quiet, a response by Helen Zinna Smith, from 1930, which is largely undiscovered. One recounts the FWW from an exclusively male perspective, the other from female one. Which is better/more powerful/more effective? A friend prompted me to read A Room of One’s Own, Virginia Woolf‘s feminist lecture from 1929, in which she reflects on why there are so few women writers and poets; it’s basically because they lack the mental, physical and financial freedom or space. It’s impossible to disagree with her analysis, and it’s also one which can be equally well applied to all sorts of other groups which are un(der)-represented in the world of literature. It’s a lively, and at times humorous piece which is at once of its time and still totally relevant. So Woolf got me thinking again about an issue that I have often considered: the differences between men and women as writers and as readers. And, obviously, these thoughts are from a man. Woolf says that male and female minds are different, their perceptions differ, the ways they frame sentences and structure a flow of ideas in a text or a story are not the same. At one level, obvious, at another, worthy of much thought. If I were forced (totally artificial example, I know) to choose between the novels of Jane Austen and Joseph Conrad (both of which I really like), why, exactly, would I opt for Austen? Choices in reading provide more food for thought. I have known women who made a deliberate choice not to read books written by men. This has always seemed to me to be rather limiting, but then you might say ‘well you would say that, wouldn’t you?’ I have also known women who just seemed never or very rarely to choose to read books by men, and wondered why, since I have always felt there are lots of really good books by men that it was a shame they didn’t read… and yet had little success in persuading them. I don’t think I’ve got anywhere clear yet, other than being reminded of some very real differences that do exist, that x years of feminism haven’t ironed out even if they could be ironed out, or it were desirable; I would be very interested in others’ thoughts on this issue. Eventually he comes across a female survivor who has lived in an airtight underground vault all her life; he is drawn to her, as you would expect, but also repelled, as he cannot face the prospect of being party to starting the whole human calamity off all over again, and spend the latter stages of the novel wresting with his and her feelings until the inevitable resolution. I’ve probably made it seem rather daft, and not worth the eyeball time; it is a historical curiosity in many ways, and the initial premise is far less credible that Ronald Wright‘s (see my last post); as a novel about an apocalypse it’s not as good as The Last Man or After London, but it’s still worth a read for any afficionados of the genre. Shiel does raise real questions: how would an individual cope with being the sole survivor of the species? What about the moral issues involved in being the last couple: is there a duty to continue the species, or would the planet be happier without homo sapiens? Is there any guarantee against the species making the same mistakes all over again? 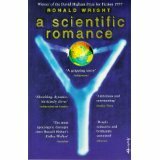 My post on dystopias (24 July) sent me back to apocalyptic fiction, as I thought it would, and firstly to another re-read of Wright’s splendid A Scientific Romance. One could, uncharitably, argue that there’s nothing original here: he’s lifted the concept from Wells, and imitated 19th century apocalypses like Mary Shelley‘s The Last Man and Richard Jefferies‘ After London, or MP Shiel‘s The Purple Cloud (and re-visiting this one is next on my list), and Wright acknowledges these in his notes. And yet, it’s a stunningly good novel – first novel – which won awards when first published. It’s framed well, by an expired love triangle remembered with fondness by one of the members addressing the others; it’s erudite, abounding in references to texts from the past as he writes about our vanished present which has become a lost past in the year 2501; it’s for our times not the 1820s or 1880s or 1900s: it gains n some of its power from the aspects of our very own lives that we can see becoming our nemesis in the near future. For a genre that often leaves characterisation very thin, Wright does well: his central characters do come to life and haunt us. I think in my league table he comes pretty close to A Canticle for Leibowitz. There’s a single, interesting idea to this novel. If Jesus Christ was the son of God and born as a man, how, exactly, did he grow up and into the role? How might he have wrestled with the gradual realisation that there were other expectations of him that just normal human life? Might he have resisted, not wanted this role which was being urged on him? If a man, presumably he enjoyed ‘free will’ and had the right, therefore, to say ‘no’ to his dual role? This is a question not dealt with by any gospel narrative, which starts from the fait accompli – he does what was expected of him, according to prophecy/ myth/ whatever you choose to call it. Kazantzakis explores the man who would like a quiet life, with a home, wife and family in Nazareth where he was born, but isn’t allowed to have this, in the apocalyptic times in which he lives, and with a voice constantly buzzing in his head to tell him that he has a special role to fulfil… and if it’s God who’s that voice, then guess who is going to win. 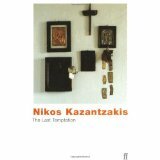 In the closing chapter of the novel, as he fulfils his destiny at the crucifixion – and Kazantzakis also explores the role of Judas’ betrayal as both necessary and understood and willingly undertaken – Jesus is faced with a final temptation where he is rescued from death and goes on to live the life he wished for: a peaceful life, wives, children and home. As the Romans destroy Jerusalem in 79CE his past catches up with him, he resists the temptation and the fantasised account of Matthew‘s gospel – which the author also incorporates – takes over. It’s all a dream, a fantasy; Kazantzakis was a believing Christian, and yet his book caused a great stir when first published, and again when it was filmed. If one is a traditional Christian, I can imagine one might be enraged or offended, one might find it blasphemous, though heretical goes a bit far, as it’s only a novel. But one does not have to read it. One can also step back from it, and accept it as just another piece of speculative fiction, an alternative imagining of a time in the past. Other writers have engaged with the same material: Dorothy L Sayers in the celebrated radio drama of the 1940s, The Man Born To Be King, Mikhail Bulgakov from Pilate‘s point of view in The Master and Margarita, for example. And one can say that it’s ultimately irrelevant, I suppose: Jesus Christ was/ has been a very influential thinker and teacher whose ideas, like those of Buddha, Muhammad (peace be unto him), Confucius and others, have survived for centuries and influenced humans, who have done both good and evil in his name. An interesting read, but I won’t be going back to it. 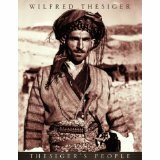 Not a read, but a look: this is a book of some of Thesiger’s photographs, from many of the places he explored and of the people he lived with. I found it interesting, as an amateur photographer myself, and also as a relic of the past to which Thesiger was so attached. All the photos are black and white, which is fine, though adds a dated quality per se: we are so unused to monochrome images nowadays, either still or moving. And there is a serious difference from colour images, it seems to me: Thesiger’s photographs of people – portraits – are incredibly sharp and the tones and detail are marvellous. I’m sure the same amount of actual data is captured in a colour image, but is somehow more effective, more striking in black and white (or, is this just us romanticising the exotic?). Clearly, the portraits of people from many lands were easy to take: they are almost all posed, either individual or small group, in a way that photos are not, and do not need to be, nowadays; the subjects are willing and the light is almost invariably very good. There’s an immense amount of detail in things like the weave and colour tones of clothing and ornaments. I think it would have been extremely difficult to take ‘spontaneous’ shots in those places and at that time. It’s rather different with views and panoramas: these tend to be rather grainy, the images slightly vague and diffuse; this, in itself, suggests the past. Particularly with the desert photographs, there’s an uncanniness, an eeriness. Certainly, I find colour pictures taken more recently are able to give a better impression of such places. I’m glad that Thesiger took all these photographs of places and people: it’s an impressive record of what the title suggests, a vanished world. If you have read any of his books, then you will enjoy the images here. Thinking about utopias and dystopias in recent posts reminded me of post-apocalyptic scenarios. It might seem as if that particular strand in literature must be a relatively recent one, in that only since the invention of nuclear weapons have we been forced to accept the possibility that we could annihilate ourselves as a species. But no: back to Mary Shelley, author of the more famous Frankenstein. She wrote a novel which I think I prefer, because it’s rather less frantic and over-written than the former – The Last Man, which describes just that situation: a plague gradually kills off all human beings save one, who travels through the empty and deserted remains of civilisation, reflecting on his fate. It’s an astonishing effort of the imagination, and deserves a wider audience. 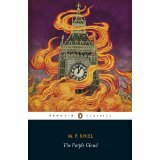 Early in the twentieth century, in The Purple Cloud, M P Shiel imagines a similar series of events. Perhaps because we are such a social species, writers have striven to imagine the opposite. Perhaps because we are a warlike species, they have sought to imagine us ultimately defeated, by greater forces than ourselves – H G Wells could have had us completely annihilated by the Martians in The War of the Worlds, but chose not to, developing a different message for the human race by pointing out the fragility of any organism when faced by unknown microbes or bacteria. John Wyndham imagines a combination of elements dealing the death-blow to humanity in The Day of the Triffids: another warning about humans over-reaching themselves. Deadly plants which can communicate with each other wipe out the blinded human race, except for a small enclave which retreats to the Isle of Wight, there to exercise constant vigilance against the dreaded weeds. I think the best, and most harrowing and haunting, at least to my knowledge, has to be Walter M Miller‘s A Canticle for Leibowitz. It’s set in a remote, post nuclear holocaust future where a bastardised version of the Catholic Church strives to preserve the knowledge of the past in its monasteries; slowly and painfully, civilisation is re-established, but only for humans to gradually and inevitably make the same ghastly mistakes all over again: nuclear weapons are re-invented and wreak their horrific toll once more. Such a pessimistic vision of the species and its history could only have come out of the 1960s, with the threat of annihilation hanging over the world. It’s beautifully written, painfully described, and leaves us with no hope. So, what’s with all the cradle-snatching in Jane Austen’s novels? Prompted by an interesting article in the Daily Telegraph about the 200th anniversary of the novel’s publication, I had one of my periodic re-reads of what is still my favourite Jane Austen novel. 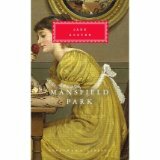 The scope of Mansfield Park is far wider than that of her other novels: she writes about the failings of a whole social class, the landed gentry, when faced with the fashionable, less moral city folk: they are too smug and self-satisfied and do not understand the threat from new ways and looser morality. The conflict is viewed through the interactions of the two families, the Bertrams and the Crawfords, and whilst it seems that the Bertrams survive, the family is much weakened and chastened and only with a serious transfusion of new blood from outside the immediate family does it regain some equilibrium. Austen does not oversimplify the issues: the subtle drawing of her characters allows her to explore the minutiae. Thus the Crawfords are influencd, and somewhat changed by their contact with conservative, country values: maybe Henry has a clearer understanding of love, and his sister, too, and there is some (small) sympathy at the end, whereas there is none for the fallen Maria Rushworth. Fanny Price is the prig many critics have felt her to be, but not pushed too far; in the end I always find myself liking her, in spite of her flaws. The structure of the novel is masterly, centred around three key episodes, one in each of the three parts: the Sotherton visit, the ball and Portsmouth. Jane Austen sees that society is moving on; she does not seem to like where is is going – conservative with that small ‘c’ – the influence of the pernicious, modern, urbanites is to be resisted if what is worth saving of the old world is to survive. And the cradle-snatching? Well, it came to me, as Austen drifted superbly into the resolution in her final chapter, where Fanny gets her Edmund at last, that he has been her friend and confidant since she was ten years old; in Emma, Mr Knightley actually cuddled Emma as a baby, and in Sense and Sensibility the consolation prize for the reformed Marianne is the ageing Colonel Brandon… I’m still thinking about the implications of all that, and reviewing the pairings in the other novels.